4 April 2019 Unlocked content from the archive. David Hunt returns with his second offering for children following 2016’s The Nose Pixies. Taking the story of an imaginary friend and telling it from the other side, we hear of the games that Rupert plays with William, the boy who imagines him. Despite the fun, the power imbalance becomes apparent when Rupert has no say in the games they play (which he never wins), and if William stops imagining him, Rupert shows us that he will fade and disappear completely. When William says he wants a real friend with whom he can play football and sit at lunch with, we’re shown that defining what a ‘real friend’ is can be entirely up to the individuals involved. Award-winning illustrator Lucia Masciullo uses mixed media to contrast muted earthy tones with the bright colours of Rupert’s imaginary world. Despite the sometimes-awkward flow of the narrative, visual cues keep the reader oriented and bring out many of the punchlines the text leaves space for. 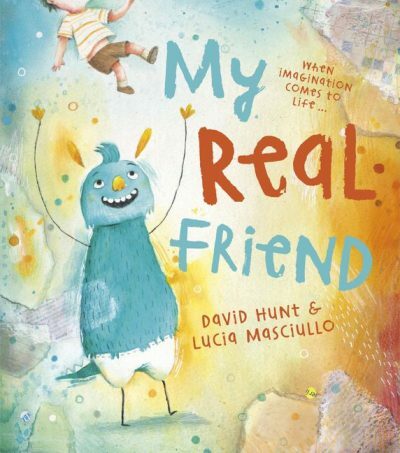 Ideal to share with children aged 4-7, My Real Friend can easily be imagined onto the shelves of any library or lower primary classroom.